1. Start by arranging a 4 part Bach chorale or hymn – find one in a band-friendly key and just write it out for the instruments and hear it played. There is nothing like hearing something you have put on paper realized with living breathing musicians. It is still the best way to learn – to hear your music played. Don’t change voices – what I mean is don’t have an instrument play some Alto parts and then switch to Tenor and so forth. Keep the integrity of the SATB lines. What this does is show you that all that is needed for a pleasing sound in any arranging situation is 4 parts, and it sounds super full just like that. Less really is more when arranging. 2. Picking the key is the most important part of arranging. First determine who you want to have the melody and then make sure the key works for those instruments. I often take longer to pick the key than actually arranging the tune. I cannot stress how important that is. As a part of that, pick keys that work for band (flat keys – Bb, Eb, F, Ab are best), because they work best acoustically on the instruments with the least problem notes. For strings, of course sharp keys work better acoustically (sharp keys – D, G, A). 3. Next, write the bass line, and make sure it works in counterpoint to the melody. The bass line should help the music get over the bar line, so not just whole notes. Having good bass line movement helps to propel an arrangement forward. This is something many beginning arrangers do not pay enough attention to when writing arrangements. 4. Next, write a countermelody – again, it must work in counterpoint to the melody and bass line. Countermelody moves when the melody is at rest or sustaining. Don’t let the countermelody get in the way of the melody. Don’t add a countermelody if it is not needed, but certainly a well-crafted one will help many songs feel more complete. 5. Lastly, add a rhythmic accompaniment – but be careful not to add too much – the listener cannot grasp too much going on at once. 6. You don’t need #3, 4 or 5 all of the time. It is nice to have thin textures (something that is not done enough in my opinion) – just melody or just melody and bass line or just melody and countermelody or just melody, bass line and countermelody or just melody and rhythmic accompaniment. But, just like a Bach chorale, no more than 4 things are needed or there will be no clarity. 7. Rhythmic clarity is important – rhythms must line up top to bottom or it will be impossible to make it sound clean. 8. 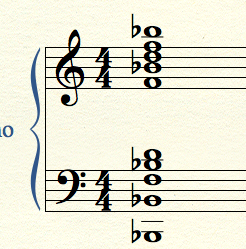 Harmonic clarity is also very important – It is not good for the trumpets to change chords on the and of 4 for example while others change on 1 of the next measure. 9. Don’t write non-chords – one of the things young arrangers do wrong a lot is to try and write harmony on every note, sometimes causing there to be not real chords. This causes what I call uncomfortable counterpoint. 10. Use part writing rules you learned in theory – Why? Because they work! You know, 7th resolves down, 3rd resolves up, etc. You certainly can break the rules, but you have to know the rules first so that you can break them for a good musical reason. Bonus – If you are writing for marching band, you should consider “Hot Zones”. Yes a trumpets can play a written low Bb, but will it give you the best punch you are looking for outside? Keep these things in mind if you want your arrangements or compositions to sound their best. Good luck!